Breakfast is the most important meal of the day. On how balanced it will be, depends on the mood, performance and overall condition of the human body. The correct breakfast is porridge, fruit, dairy products, eggs, as well as some fish or meat. But not all together, of course. Eat breakfast yourself, share lunch with a friend, give dinner to the enemy – this saying is known to almost everyone, but in fact, most of us donate breakfast – we do not have time, then we think that it is not needed, in general, they find a lot of reasons to miss it. But both lunch and dinner, we eat on their own, and sometimes with the addition. We have collected 5 reasons why it is better not to miss breakfast! It is proved that people who do not miss breakfast, quickly part with those extra pounds. The fact is that a tight, balanced breakfast helps to reduce food eaten during the rest of the day by 15-20%. Thus, in a month you can lose 5 -11 lb of excess weight. 2. Charge of energy and good mood. Lack of breakfast increases irritability and fatigue. It also decreases the concentration of attention, because brain cells did not receive the nutrition they needed on time. So if you want to spend the whole day in a good mood and to please others with your positive – you just need to have breakfast! Morning food intake allows to improve concentration of attention, and also to remember much more necessary information. Thus, breakfast directly affects the improvement of the quality of work or study. Especially breakfast is important for those who spend all day in an office chair – as was written above, this will not only increase efficiency, but also prevent the appearance of extra pounds. A well-fed organism is much more effective in fighting infections and prevents serious diseases. 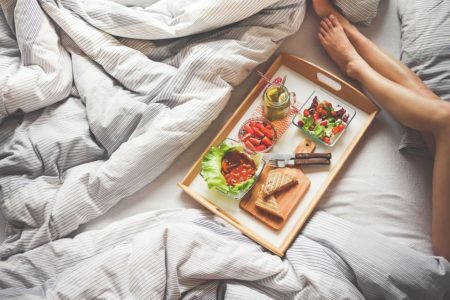 Studies have shown that people who do not miss the morning meal are less likely to get sick, tolerate stress more easily and do not fall into depressive states. The habit of having breakfast in the morning will help prevent diabetes, diseases of the cardiovascular system, cholelithiasis. A full breakfast controls insulin production, reduces the number of platelets and cholesterol in the blood, and also allows you to avoid long breaks between meals, which, in turn, provokes stagnation of bile. Start breakfast right from tomorrow morning. Do not delay it until Monday, next month or year. To develop this good habit, you should not miss the morning meal for 14-21 days, and very soon you will notice positive changes in your body.